I made the acquaintance of Arnold Krug, desert artist, while curating an exhibition for the Mesa Historical Museum in Arizona. This exhibit featured the work of two artists who had lived for periods of time at Mesa’s historic Buckhorn Baths. The Baths, a hot-spring spa and resort that catered to baseball’s Cactus league teams, was owned and operated by Ted and Alice Sliger, a kindly couple who had a soft spot for desert art and artists and who frequently offered a home to those in need of one. 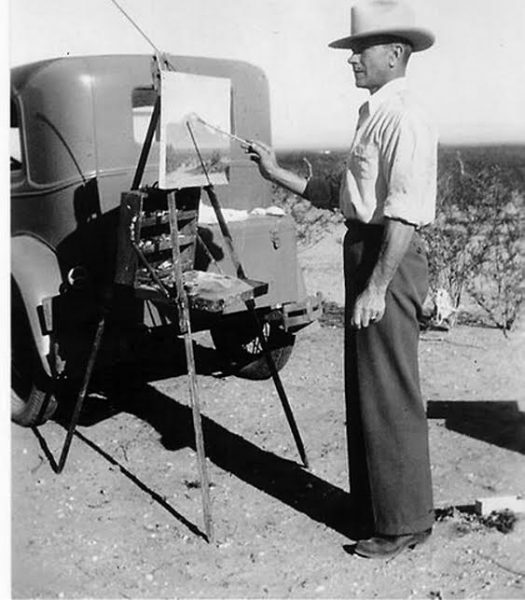 Arnold Krug painting al fresco in the Arizona desert, circa 1940. One of the two exhibited artists, George Frederick Gleich, was flamboyant, an avid self-promoter, and a fellow who left a trail of biographical tidbits a mile wide. The other man in the exhibit–undisputedly the better artist–was Arnold Krug. Arnold Otto Krug was born June 7, 1896, in Forest, Fond du Lac County, Wisconsin, the ninth of Joseph J. and Katherina Immel Krug’s ten children. He was christened on July 12, 1896, at Saint Paul’s Evangelical Lutheran Church and School in Forest. St Paul’s was located in an area known as the Holyland, according to Arnold’s great-nephew, because of the many Catholic churches that were “the center of the little town’s social life (along with, of course, the one or two taverns).” St. Paul’s Evangelical Lutheran is the only Protestant church in the area, and Arnold received his education at its school. Superstition Mountains, 1935, by Arnold Krug. Buckhorn Baths Collection. One of the mysteries associated with Arnold is that he was christened Arnold Otto Krug, but on both his World War I and World War II draft registration cards, his name is given as Arnold Christ Krug. In the Fond du Lac City Directories for 1921 and 1924, he is listed as Arnold C. Krug. Why and when he adopted the Christ is a continuing puzzle. Arnold seems to have never signed his artwork other than “Arnold Krug.” A family member theorizes that he may well have had more than two given names since that would have been fairly common practice at that time. Krug’s parents were both born in Germany and immigrated to the United States as children. In the 1905 Wisconsin Census and in the 1910 Federal Census, Arnold was noted as living in the very small farming hamlet of Forest with his family. At some point between 1910 and 1920 the Joseph Krug family moved from Forest to 94 8th Street in the town of Fond du Lac, but in 1918 Arnold was living in Calvary, Wisconsin, working as a farm hand for Henry Wagner, his brother-in-law. From 1919 until 1928 Arnold is listed in the Fond du Lac City Directories as living with his parents and sister Ella, and until 1924 his occupation is given as “carpenter,” after which he is noted as a “mechanic.” The house on 8th Street most likely belonged originally to Joseph and Katherine Krug and was inherited by Ella. Arnold rented a room from his sister, and their mother Katherina also continued to live there until her death. After Ella’s husband died in 1929, she and her two daughters went to live with another sister. This is probably when Arnold moved to Milwaukee to continue work as an auto mechanic. 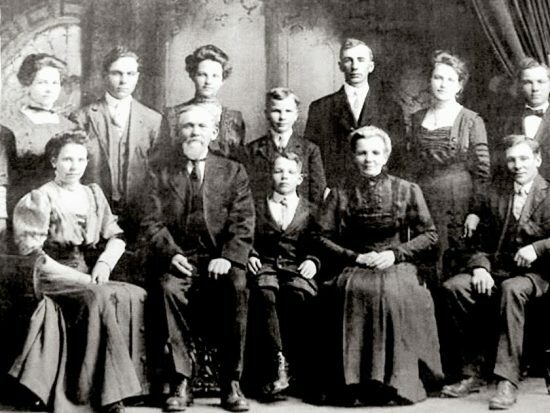 The Joseph J. Krug Family, 1906. Arnold is the boy in the middle of the back row. The Krug family was close-knit. Arnold’s nephew recalls that, when the Krug brothers had a hog-butchering “bee,” Arnold drove in from Milwaukee to help and that in 1939 five family members packed into a Model A Ford to travel from Wisconsin to Arizona to visit Arnold. Arnold seems to have moved back and forth between Phoenix and Wisconsin on a regular basis. His obituary in the May 10, 1942, Arizona Republic newspaper says, “Mr. Krug, who made his summer home in Fond du Lac had wintered [in Phoenix] for the past seven years during which he concentrated on painting Arizona mountains and desert.” During Arnold’s final days, two of his sisters made the long trip to Arizona to be with him and, after his death, accompanied his body back to Wisconsin. Both the 1929 Milwaukee City Directory and the 1930 Federal census show Arnold–and sixteen other boarders–living in a lodging run by German-born Otto E. and Clara Heine. (German connections figured large throughout Arnold’s life.) Arnold may have continued work as an auto mechanic in Milwaukee in between trips to follow his painting passion in California and Arizona. His obituary states that he “had resided in California and Phoenix for the last 15 years,” indicating that he had come and gone from Wisconsin since at least 1927. In the 1930 Census he is listed as being a “repairman, auto service.” In 1933 a Milwaukee City Directory shows Arnold working as a repairman for the Edwards Motor Company, one of the largest automobile dealers and service providers in Milwaukee. Bishop Creek, High Sierra, 1938, by Arnold Krug. Private Collection. Arnold’s infrequently dated artwork offers some clues about his peripatetic lifestyle beginning in the early 1930s. 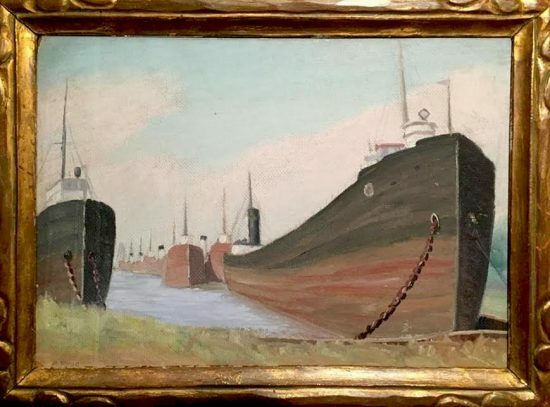 A 1934 painting depicts transport boats on the Great Lakes. He also painted in many areas of California. A canvas titled “Bishop Creek, High Sierras, Cal.” is dated December 1938. A similar oil on canvas depicts the Minarets, a jagged range of peaks in the Sierras. A painting of San Juan Capistrano Mission is undated, as are two lovely California-coast seascapes. 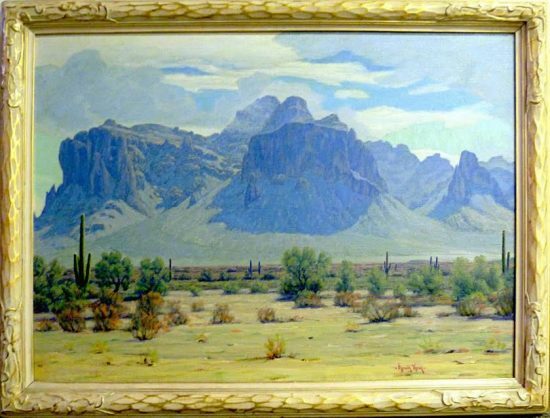 There are several Krug paintings that are clearly not Arizona landscapes but that may possibly depict the Jacinto Mountains and smoke trees of the Palm Springs area. An especially lovely canvas by Krug features the Servilleta Mountains near Taos, New Mexico. “Sleeping Giants”. Great Lakes Transport Boats, 1934, by Arnold Krug. Private Collection. Superstition Spring Time, by Arnold Krug. Courtesy of Blue Coyote Gallery. Following a two-year illness, Arnold Krug died on May 8, 1942, in Phoenix, Arizona, from bronchial pneumonia, a complication of brucellosis. In 1995, Alice Sliger, proprietoress of the Buckhorn Baths recalled, “[Ted and I] were married about nine years before our first child was born. I think this was due to the fact that I suffered with undulant fever [brucellosis] during those years. It is caused by drinking unpasteurized milk. An artist friend, Arnold Krug, who lived in a small room here and spent lots of time with us, got undulant fever too, but he did not survive it.” Arnold’s address at the time of his death was another boarding house at 303 West Willetta Street, Phoenix, AZ. Funeral services for Arnold were held both in Phoenix by the pastor of the Evangelical Lutheran Church he attended and at home in Wisconsin. He is buried at Fond Du Lac’s Rienzi Cemetery. Arnold’s family confirmed that he was self-taught. His passionate desire to make art shaped his short life, and he certainly wasn’t the first young artist to be seduced by the wide skies and dramatic landscapes of the West. Since Arnold infrequently dated his artwork, analyzing it chronologically is difficult, but, by examining it stylistically, his paintings can be seen to develop and refine over the years. One of his paintings, a charmingly naif portrait of his toddler nephew Edward Wagner, may have been painted as early as 1918 when Arnold lived with the Wagner family. 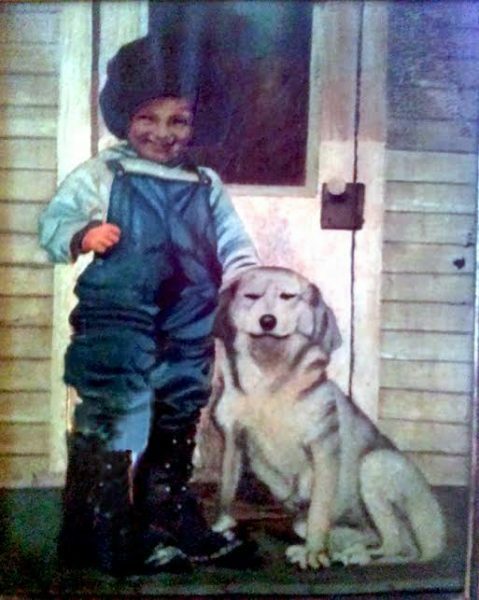 Edward was born in 1913, so it would have been entirely possible that this painting dates from then. (This is the only extant portrait that we know to have been painted by Arnold Krug.) 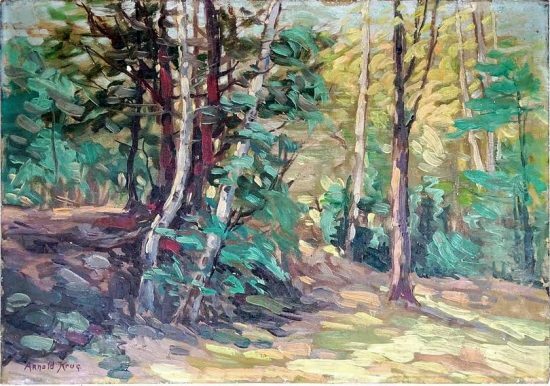 Another early painting of an impressionistic forest scene, sold in an online auction, was noted as having been painted in the late 1920s. It’s quite loose and impasto in style, vastly different from Arnold’s later more atmospheric landscape vistas painted with precise and controlled brushwork. The auction site noted that this painting is similar in style to the impressionistic artwork of Francesco Spicuzza, a Wisconsin artist whose work was widely known and enthusiastically emulated at the time. Edward Wagner and Sporty, by Arnold Krug. Private Collection. Forest Scene, late 1930s, by Arnold Krug. Private Collection. 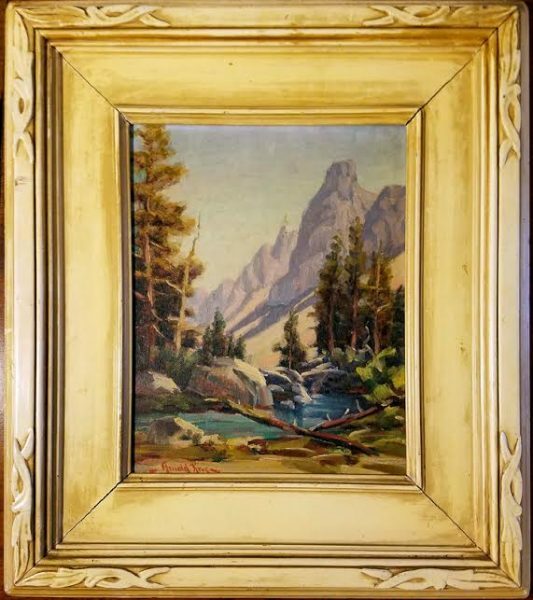 One of the several canvases that Arnold painted in California’s High Sierra Mountains is dated 1935. All of these High Sierra pieces, likely done around the same time, are rendered in a broader, more “painterly” style than his later desert scenes. Two California-seashore canvases are equally loose in brush stroke and heavily textured, as is the only architectural painting I have seen of Krug’s—the mission church at San Juan Capistrano, California. 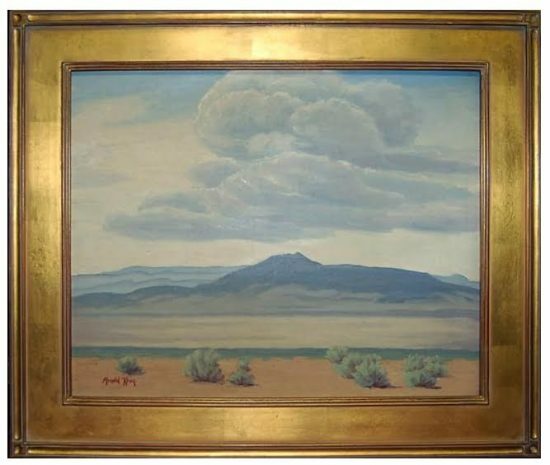 When Arnold Krug began to paint the desert landscapes of California, New Mexico, and Arizona, he found his niche–one of his loveliest desert paintings typical of his later style is a 1935 oil-on-canvas titled “Servilleta Mt. Napkin Mountain, Taos, N.M.” His paintings from the mid-1930s until his death in 1942–most often panoramic views of sky, desert floor, and mountain–show real maturity as an artist. Arnold was fairly prolific as a painter and obviously enamored by the beauty and grandeur of the desert. The Phippen Museum in Prescott, Arizona, included two of Krug’s pieces in its 2011 exhibition, Arizona Visions: Paintings from the Picerne Collection of Arizona Landmark Art, as well as including their images in its exhibition catalog. Gary Fillmore, proprietor of the Blue Coyote Gallery in Cave Creek, Arizona, curated this exhibition, and his Gallery also carries Arnold Krug’s artwork. 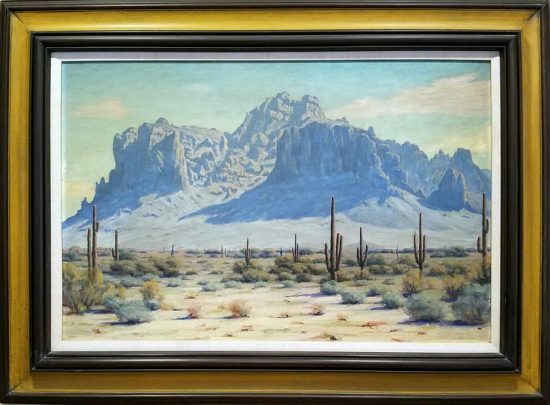 The Superstition Mountain piece he selected for this exhibit is typical of Krug’s best work—the foreground desert precisely and crisply depicted with the majestic mountain range, silhouetted against a vast Western sky, rising out of a desert haze. Servilleta Mountains, Taos, New Mexico, by Arnold Krug. The Picerne Collection. Reserved and self-effacing, Arnold Krug neither taught art classes, nor joined organizations, nor promoted himself. 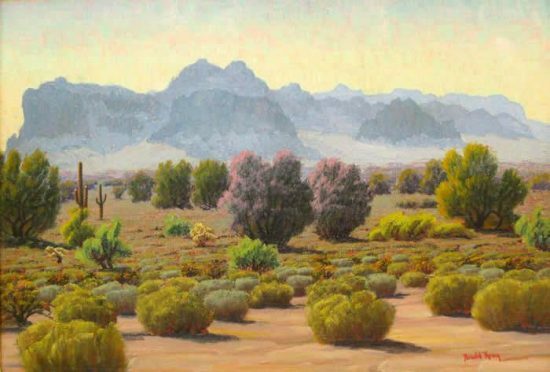 He was simply a focused, dedicated, and disciplined artist who, according to his family, went dutifully “into the desert at the same time every day to paint.” Arnold Krug died much too soon at 45, but departed at the height of his prowess as an artist. I think it’s fair to say, judging from the quality of the body of his work, that he deserves inclusion in the top ranks of those artists who record the beauty of the desert. While Arnold Krug may have never married, it’s abundantly clear that, in sickness and health and until death did him part, he was passionately, deeply, and abidingly in love with the desert Southwest. Rebecca Ragan Akins: A theatrical costume and puppet designer with over 130 shows to her credit, Akins has been involved for many years with arts education in Arizona–recently concluding a 21-year stint as Curator at the Arizona Museum for Youth. The Tempe resident previously taught and was costumer/costume designer at the University of Denver Theatre Department. In 1985 Akins received the Arizona Women’s Partnership Governor’s Award for “Women Who Create,” and her own artwork has appeared in many galleries and exhibitions. Over the years she has received many AriZoni Theatre Awards for Excellence in Costume Design. Akins is active in the local arts community — guest-jurying exhibits, moderating arts panels, and serving on the boards of the Central MuseumAssociation of Arizona, the Museum Association of Arizona [MAA], the New School for the Arts & Academics, the Executive Board of the Tempe Municipal Arts Commission, and the Daniel Nagrin Theatre, Dance & Film Foundation. Her last article for California Desert Art was about George Frederick Gleich: http://www.californiadesertart.com/?p=2509 After having spent quality time poking and prodding at Gleich and Krug, Akins has developed a keen interest in the artists of the desert southwest—those intrepid souls who willingly sacrificed security and comfort to follow their bliss. Akins can be reached at rrakins@cox.net. Great article on ARNOLD KRUG. yes, impressive research and wonderful eastern sierra landscapes! i am pleased that arnold c. krug lived the last years of his life, following his dream!